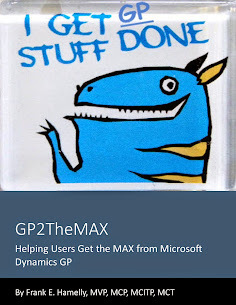 GP2TheMAX - Helping users get the 'MAX' from Dynamics GP: GPtip42day - Why does one Item show different costs on the same receipt? GPtip42day - Why does one Item show different costs on the same receipt? Occasionally, or maybe more often, you process a receiving transaction for a multiple of an Item at an Extended Cost that isn't evenly divisible by the quantity. Take a look at the screenshot below, for example. This is a snapshot of a modified Purchase Receipts report. Note that for RCT1607, there are two receipt lines, the first with a quantity of 4 @ $6,314.60 and the second a quantity of 1 @ $6,314.59. Why is this? Because the receipt was entered for a total quantity of 5 and an Extended Cost of $31,572.99. GP can't divide the cost evenly across 5 pieces because the Item's Currency Decimal setting is 2 decimals. Therefore, it posts the receipt in two lines as seen above. This same scenario can occur in a multicurrency environment when the Originating and Functional Currency rates result in an exchange difference than can't be apportioned evenly across the quantity received. GPtip42day - Are hotfixes cumulative?